Flooding on Mozambique’s coast, Jan. 2012. Jan 26, 2012 • On January 16, 2012, Mozambique’s coast was hit by the tropical depression “Dando” followed by cyclone “Funso.” With wind speeds up to 220 km/hour and torrential rains, the storms have caused severe damages and floods. 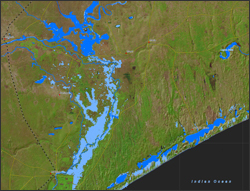 This map shows the open inland water extent in the coastal areas of the provinces of Maputo and Gaza. The open water was detected by semi-automatic analysis of Radarsat-2 data acquired on January 25, 2012. The normal water level was derived by combining SRTM Water Body Data with manually extracted water features as seen on Landsat 7 ETM+ data. Due to radar sensor characteristics the flood extent might be underestimated in areas with flood waters beneath vegetation. Landsat-7 ETM+ imagery acquired on October 17, 2002 and May 29, 2003 overlaid on hill-shaded SRTM elevation data serves as backdrop.